Brian makes both customized fountain pens for customers (sold through his website), and non-customized pens (sold through authorized dealers). 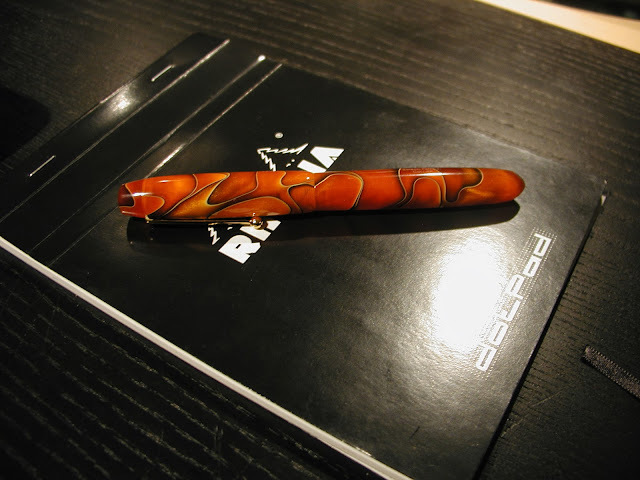 The one above is from his non-custom line and is the "Collier" model in the Persimmon Swirl pattern. It's a large fountain pen (5.9 inches capped) that does not post, although the length of the barrel (5.1 inches) and width of the pen (0.59 inch) makes it unlikely you'd even need to post it. It's one of the largest fountain pens I've tried, writes beautifully, and, weighing in at 30 grams, is very comfortable to hold. Many thanks to Greg for bringing it to our meeting for all of us to see. It's definitely on my Wish list!